I have wanted to try Yuba (tofu skin or bean curd sheets) for quite sometime now, but I always end up purchasing other forms of tofu instead. Yuba is made from soy milk. The process is quite interesting--the soy milk is heated at very low temperatures and the fat/protein rises to the surface and creates a solid film, which is then collected and is sold either fresh or dried. For this recipe I used fresh and recommend that you purchase organic Yuba to avoid GMOs. Also, here is a YouTube video from Hodo Soy Beanery in Oakland, CA showing how they make tofu and Yuba from scratch. Seems like a great company and you can't get any fresher than this! In a small bowl mix together, hoisin sauce, soy sauce, chili sauce, rice wine, and agave nectar and set aside. Prep beans and blanch in boiling, salted water for two and a half minutes until crisp-tender and cool immediately in an ice bath to stop cooking, drain and set aside. Prep Yuba and heat a large frying pan on medium heat. Add canola oil and sesame oil and fry Yuba strips for about two minutes until they start to curl and get crispy. Remove from pan and set aside. Spay frying pan with cooking spray, add garlic, ginger and chilies and cook for a minute until fragrant. Add 1/4 cup water and cook until most of the water is evaporated. Add sauce and stir to combine and cook for about a minute or two until sauce thickens slightly. Immediately add blanched green beans and Yuba sheets, tossing to heat through, adding more water if necessary. 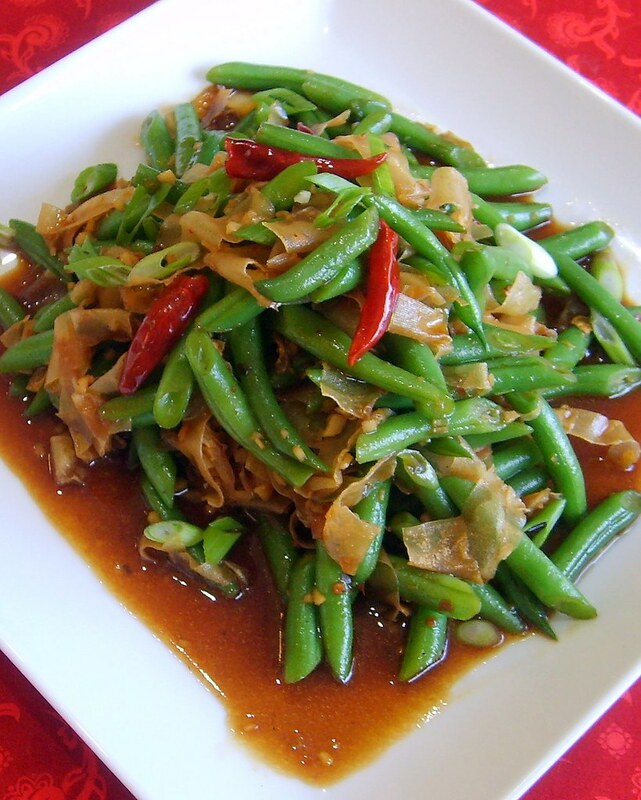 Garnish with additional green onions and serve with brown jasmine rice and more chili sauce if desired.